I was looking back at a school photo of myself in fourth grade. I actually had a true smile I realized when I looked at it though I remembered my mother had had to trim down a newer shirt of my father’s for me to wear since I had nothing special. She’d carefully hemmed the sleeves and sown tucks in the back. The background of the picture had that non-commital blue somewhere between a pale navy and commodore. The smile had been an inkling of fore-knowledge perhaps for when I came home from school, I was advised by my mother to put away those special clothes for my usual much patched clothing. She lead me to the garage attached to our house. The front rolling door was down, so it’s interior was in shadows except for the two dirty beams coming in from the clouded narrow windows at the side. At the back, the door was open and it looked out into an early autumn golden backyard. The grass just beginning to dry, and the sky was pale blue just a sliver showing under the tin overhang which covered the small concrete slab which was the deck. She smiled at me, my mother, and told me to go on down the two shallow steps which connected the small kitchen/dining room to the garage. Inside a high sided box which reached above my knees, wriggling on a blue folded blanket, was a small but very plump furry body which produced a yelp as I came near. How could a puppy be so fuzzy and like a needy baby but so unable to stay still? “It’s a girl”, my mother said of the puppy who had a tan body and head with black and grey spots of different sizes, but the throat was a pure white. The eyes blinked with a quick intelligence and question I immediately recognized. Every time I see that photo I remember the swelling emotions of joy and tenderness I felt looking down at my new and only personal companion-to-be. I felt so proud and special as I pulled her onto my lap and she couldn’t sit still even a second as she licked my chin and neck then the ticklish place of my elbow. I named her “Doubles”, because my mother told me in her litter there had only been two puppies. 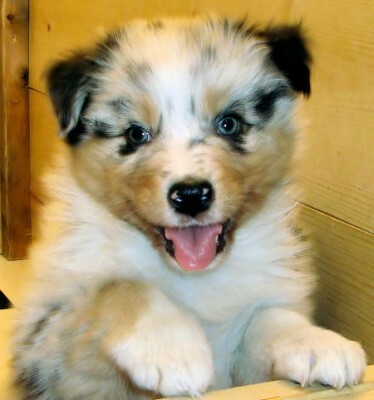 She was an Australian shepard and we soon learned the cleverness and wit such dogs display. We and she were lucky for we actually had a large backyard, living at the end of a series of shallow valleys as we did. We had a number of fruit trees, two of which produced the fruits mentioned in my memoir entry “Big Mama’s Pears”, so just over an acre of backyard, besides the front and side yards, in which Doubles had free run. In one back corner we were you might see rabbits or possums and occasionally raccoons, if Doubles caught them she was smart enough not to simply kill them, but seemed to take a special pleasure at herding them. She’d trail them just slow enough to keep them moving, but attentive enough not to let them get away. They probably felt they were being subjected to torture or some kind of cruel parade, but it was hilarious to watch. When my father went to mow the back lawn, Doubles wasn’t afraid of the noise of the machine but instead faithfully dogged my dad’s heels. If he slowed down, she’d nip. Other fits of intelligence or infuriation? If my mother hung clothes on the line out back, Doubles would sniff each and only pull mine down to lay on. If one was sweeping near her water bowl while she was drinking, she’d pick it up in her mouth and move it to a safe distance where it could be uncontaminated. What was funniest however, was if she got out of the yard, and yes, she learned early to climb the chain link fence, she would positively delight in streaking around the neighborhood, terrifying the playing children, listening to their shrieks though she would never ever bite or be aggressive. She’d let them run awhile then sit, tongue lolling, mouth stretched in what seemed a satisfied grin. As soon as they settled, she’d tear into their midst again and like birds taking flight off they’d fly. What pictures I have of Doubles after she grew up, two years old or so, she wasn’t in the backyard but generally some place from which I’d retrieved her. I’d have her in my arms struggling to keep her contained (for she’d never agreed to walk on a lease and had in fact thoroughly chewed up anyone we’d bought). She’d be looking away off, tongue out, scenting some happy madness to next take part of. If we could have been an eternal team, running through the galaxy, some distant fields, finding new things to explore or laying down in warm golden grass to rest before we thought of a game to play again or some creature to chase who might later scold us for our exuberance and laughter at their undignified haste to escape our silly clutches, it would have been ideal. But it was a time of flux in my life also, with my family, my parents. Their marriage had reached a stage which seemed to mean arguments every night but disagreements and non-comments if my sister and I were around. We were moving to a new place where there wasn’t a fenced yard and no room for an animal indoors. Beginning at my ninth year, Doubles had been my only tangible friend besides the one mentioned in the first chapter of my memoir, “The Boys Who Died”. My parents told me someone good would take her. I insisted it had to be someone who had a large yard and random wild animals she could herd. They took me to a place, a family they said would take her but their backyard was sloped and empty except for a few gnarled pines at the far edge whose needles had smothered the grass nearby. I’d been allowed to go with them as they delivered her. She’d sniffed around like a hound or terrier at a scent, very intent, then she’d looked up at us with a question as if she wondered what she was brought there to do. You were brought here for us to be parted forever. My mother had taken me away hurriedly yet I heard the special sound Doubles made, the short yelp yelp yelp grunt sound she’d make when distressed or anxious. I knew that she wanted to come with me. I wasn’t allowed to go back, to look back. I remember the denseness of her fur, and how when I’d hug her she’d lick me quick across the head with that grin of hers then look away as if thinking of what other nonsense she could get up to. She’d been a beauty and loyal, if occasionally crazy, companion. I asked my mother after that what happened to Doubles, the dog I’d written about in my picture books in my shaky young hand of how she was my friend. My mother told me Doubles hadn’t worked out at that place I’d seen but that she’d been given back to the farm she was born at and met her sister again and probably had some pups of her own. That’s the thing with smart, vibrant animals like Doubles. They don’t work in cities or little yards. They don’t exist very well with people who don’t move and play. I never knew what really happened to her, but she was my racing comet of joy during one of the darkness times of my life, when series of events no one should have to suffer let alone a child happened. During those times I could always go out to her place and lay with her in her blankets and she’d lick me and tell me settle down and rest, that she still loved me and would keep me safe. If only she could have stayed with me. She remains the brightest spot of my childhood years, and the reason I smiled on one school photo. Posted in Personal Entries. Tagged animal friends, childhood friends, dogs, fourth grade, memoirs, memories, puppies, remembering childhood. What a moving, well-written piece you’ve published here! How fortunate you were to have such a faithful “racing comet of joy” in your life during your difficult and painful childhood ( I know about such dark things as well). My father and brother had allergies so I was never allowed to have a pet as a child, even though I ached for such a companion. As an adult, I’ve been blessed to have experienced a strong, mutually-healing relationship with three animal friends at different times and places. Thank you, that’s one of the special bittersweet things of having a difficult childhood: remembering those moments when there was a kind of peace. They are very precious indeed, and more so perhaps. I appreciate your comment, and glad to hear of your animal friends also. They are really very important in life.